One of the most unlikeliest 60s groups catching the psychedelic wave must have been Herman's Hermits. 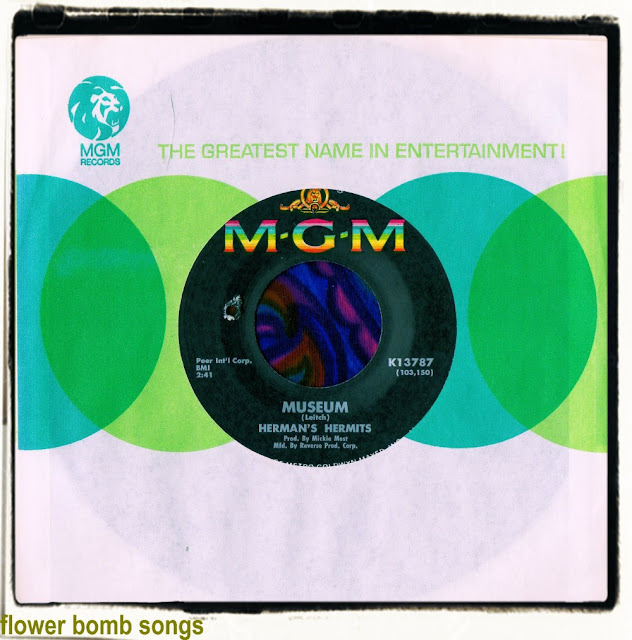 They're not a combo that has attracted much attention at EXPO67 HQ but I recently undertook a project to collect the more enterprising Donovan cover versions from 1965-1970 and someone suggested that I should check out 'Museum' recorded in 1967 by the Hermits. I must admit that I was blown away by their version. It's a super rendition and it surely must go down as one of their finest. As far as I know 'Museum' sank without trace (at least in England). It appears that the song was lost on their usual teeny-bopper girl fans and of course the psych underground wouldn't have touched the Hermits as they were considered way too uncool for them. The flip 'Last Bus Home' is also good and is another tune with a psychy feel, this one being a little 'Revolveresque'. The UK release had 'Moonshine Man' on the B-Side. Oh yeah! By a mile my most favorite Hermits track. I heard this way before I ever heard the Donovan original and must say I prefer the Hermits version. I was only familiar with Donovan's version but this is pretty good too. I'd seen this song on Herman's discography but didn't realize it was the same.